If you’ve ever been in or near a comic book store or equivalent nerd sanctuary, chances are you’ve seen a sculpture by Sideshow Collectibles. Over the past twenty years, their team of artists and sculptors have spent countless hours researching, designing, and creating busts, life-sized models, and sculptures of hundreds of pop culture characters from Darth Vader to Harley Quinn. A lot of their work has been documented in the book Capturing Archetypes: Twenty Years of Sideshow Collectibles Art (which he reviewed here), but viewing photos and getting to touch the art for yourself are completely different experiences. We got the opportunity to do the latter when Sideshow sent over a “Knifehead” statue from the popular Guillermo Del Toro film, Pacific Rim. The statue itself comes in two main parts: the actual kaiju and the base, both of which are pretty heavy and measure around 17" tall, 14.5" wide, and 20" long when assembled. We appreciate the sturdy build quality, but we definitely did not expect this thing to be as hefty as it is. Be weary of glass tables or flimsy shelving (Sideshow lists the dimensional weight at 42lbs and the international dimensional weight at 58lbs). There are also batteries for the base and a little boat that goes into the waves to match the scene of the film. It took a little finagling to get the sculpture seated properly into the base the first time, but it was very satisfying once we did and could take a step back to admire the piece. The level of detail in Knifehead is very impressive, especially considering the fact that the kaiju didn’t have much screen time in the film. The pose is menacing, the skin is incredibly textured, and the paint job is phenomenal. Both the waves and the inside of Knifeheads’s mouth glow blue with atomic (LED) greatness when you push the button on the base, making it a great addition to your home theater, or on your bedside table as a dope nightlight. Another important thing to remember about the design of this statue besides its weight, is the fact that it has a “knife” head. The nose of the sculpture isn’t razor sharp, but it is prominent enough that when combined with the denseness of the figure, it could cause some serious damage. 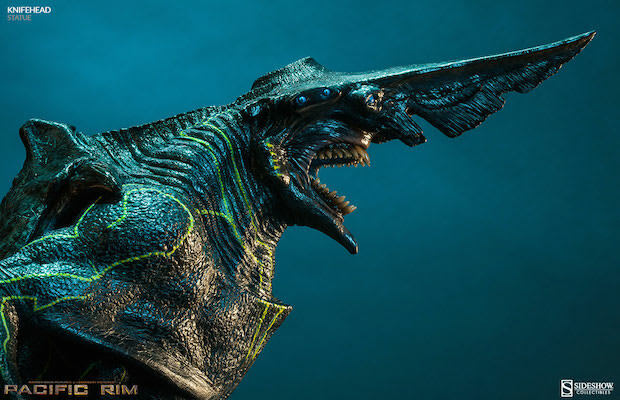 To check out the statue for yourself, as well as the other sculptures in Sideshow’s Pacific Rim collection and some behind-the-scenes footage, head to the official product page here.